Use of this marriage ceremony template for a beautiful and stylish addition to your wedding ceremony is a great choice for your wedding planning. They can be used as invitations, wedding programs or have dozens of other uses. With room for an address and other proper acknowledgements, this marriage ceremony template is a perfect choice for any wedding ceremony. This marriage ceremony template is free and easy to download. It comes as a two-sided wedding program. Once downloaded, you’ll find it completely customizable to add your own pictures and images, and the change fonts to a different style, and the red and yellow flower frame on the first page can be moved or cut. 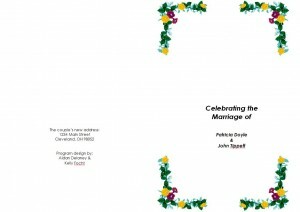 The marriage ceremony template is easy to use on Word 2003 or later, and can be stored for future ceremonies and events. A picture can be cropped to the right size to fit within the flower frame along with the text of your choosing. To make your project stand out, use a cursive stye font, such as Edwardian script ITC, or Brush style italic fonts. Scanned pictures can be added to make beautiful backgrounds for custom projects using this template for any style wedding. The flower frame can be substituted for other frame styles, or other designs to further add to the look of your project. Also, the flower frame can be copied and used on both sections of the template. The frame can be used along with other frame designs, pictures and images to give a look of variety. In conclusion, this Marriage ceremony template will allow you to come up with quick and beautiful designs as wedding invitations and ceremony programs. As well as for receptions, and even dinner invitations. It’s a perfect choice to add a unique, beautiful and graceful style.